Tivoli Gardens is expanding its season into February, with new attractions coinciding with Valentine’s Day and Chinese New Year. Copenhagen’s famous attraction Tivoli Gardens is for the second time expanding its season into February to inject some colour and warmth into this typically grey month. 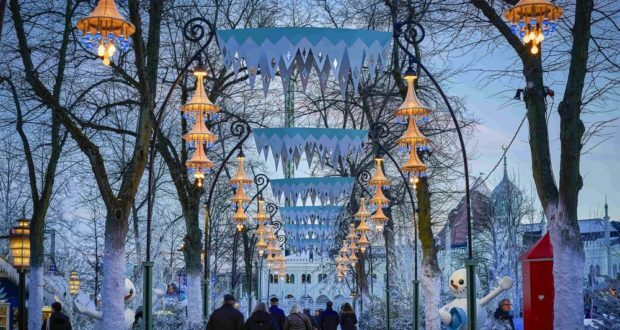 A range of light installations is being arranged for the Copenhagen Light Festival and for Tivoli’s newest season, called Winter in Tivoli, which will last from February 1 to 24 and embraces both Chinese New Year and Valentine’s Day. The February season last year highlighted Tivoli’s 175th anniversary celebrations. New experiences in 2019 include the elusive Northern Lights and a VR experience, Bring the Spring. The Northern Lights rarely grace the skies above Denmark, but Northern Lights in Tivoli Gardens is a special event near the Open Air Stage that “will illuminate the heavens with a range of electronic sounds and smoke effects to conjure up the atmosphere of the unique natural phenomenon,” the organisers promise. As for the new virtual reality experience, this will allow visitors to “explore ice masses, free the sun and enjoy the sight of the world sprouting into bloom”. A glimpse of Bring the Spring can be seen here. Meanwhile, Tivoli’s restaurants are promising romantic dinners in the days leading up to February 14, and from February 1 to 7 there will be a dining festival, Tivoli Dining Week. For families, Tivoli’s ice-skating rink returns from last year and the ‘activity igloo’ Pingonesia will be open again with a new penguin mascot. Almost all the rides will be open, including Tivoli’s 103-year-old wooden rollercoaster and the new ride Tik Tak.